Add an additional $5.00 heavy/bulky shipping charge per each. 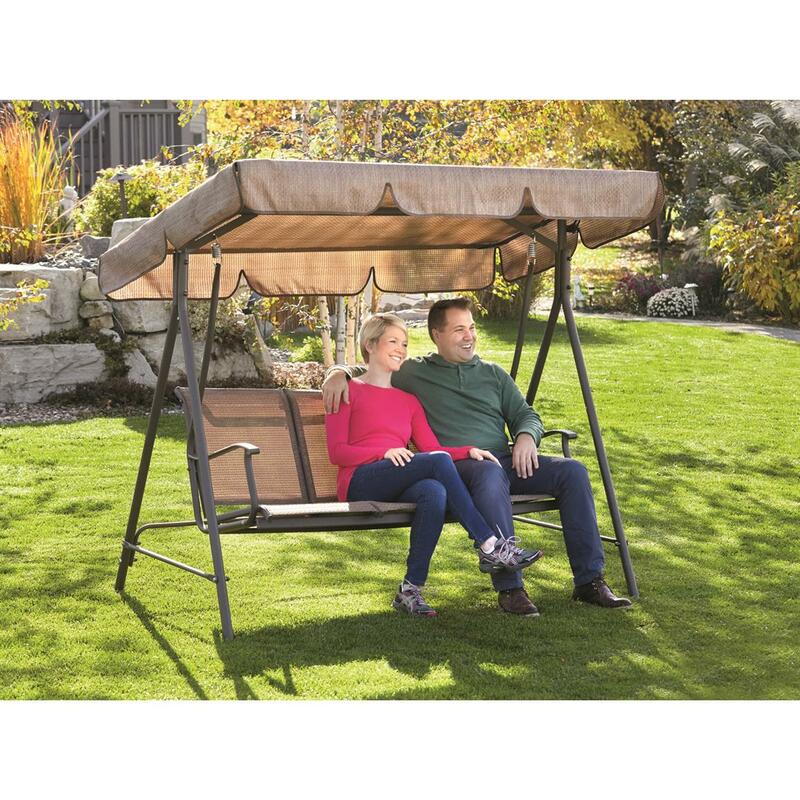 Find a cool, comfortable place to relax and enjoy the outdoors with this CASTLECREEK® Canopied 3-Person Porch Swing. Free-standing design is easy to assemble and can be placed wherever you choose to create an inviting backyard retreat. lawn. Steel frame with powder-coated finish is built to last, and the Dura Mesh seat and canopy are maintenance-free and weather resistant. 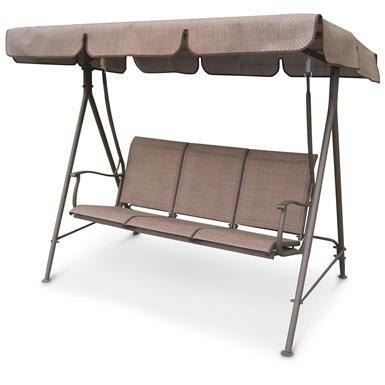 Seat Dimensions: 57"l. x 20"d.
Overall Dimensions: 45.5" x 74.8" x 64.57"h.
CASTLECREEK Canopied 3-Person Porch Swing is rated 4.7 out of 5 by 25. Rated 5 out of 5 by Bob A from Nice swing We're very pleased with the swing. Package came damaged, but all parts were there. Setup took about a half hour, with 2 people. Instructions are illustration only; a bit obscure, but it all went together nicely once we figured out which bolts went where.A comfortable seat. I'm not sure how the canopy will fare in high winds; we'll wait and see. Rated 5 out of 5 by JPShelby from Exactly the swing we had been searching for. We had been searching for a 3 seat swing with mesh seats rather than cushions to replace an ancient swing. Was easy for two people to assemble and seems very sturdy. SG had a competitive price and it arrived on time. Rated 5 out of 5 by Red42 from Reasonable priced It was easy to assemble. Very comfortable seating. Rated 4 out of 5 by Larson from Very comfortable I was worried that it was going to be flimsy but to my surprise it is very comfortable and keeps the hot sun from directly hitting You. 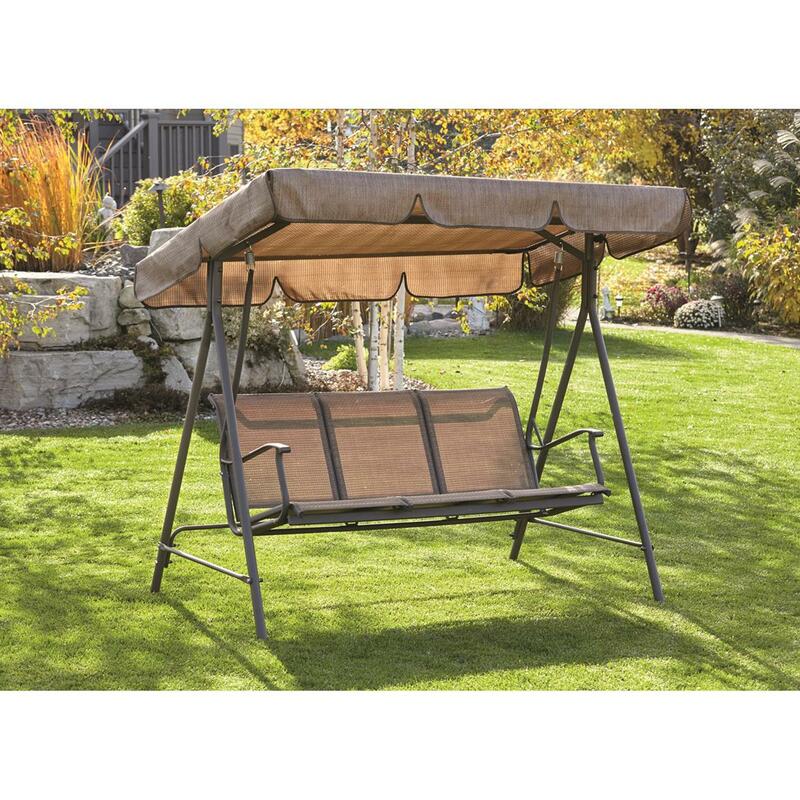 Rated 5 out of 5 by PO Brown from Great Swing Very nice swing,well made,easy to assemble... Canopy material looks like will hold up outside much better than swings i have had in the past. Rated 5 out of 5 by tadye from as expected person item was donated to was very pleased. Rated 4 out of 5 by Trish from Lovely swing! Swing is perfect for our patio that gets a lot of sun. The awning has a lot of coverage & can be adjusted to different angles. The instructions were not clear & the tools provided were inadequate. It took two of us 3 hrs to put together (and my husband is normally a wiz at these things). That was a challenge but worth it in the end. Now bring in more sun please so we can really test it out. Rated 5 out of 5 by Jerry from Great product at a great price Quickly shipped. Be ready for 83# package. Well packaged, no damage. Assembly instructions are sketches. Take the time to fully understand what part goes where and it goes together in under 2 hours by one person. Finished product is very sturdy, strong, comfortable and attractive. Seats 3 adults no problem. Only tools I used were a socket wrench and an open end wrench. All nuts are nylock so I expect nothing to loosen as we enjoy this swing. We shopped very hard before making a purchase and I believe this is truly a BEST BUY.